Want to share the big news with friends and family living in different places? Do Skype group calling for free. Skype lets you set up a conference call or group video call with up to 25 people. It is a built-in feature and doesn’t require any additional software apart from Skype. The people in the conference call can have any mobile device or desktop systems. 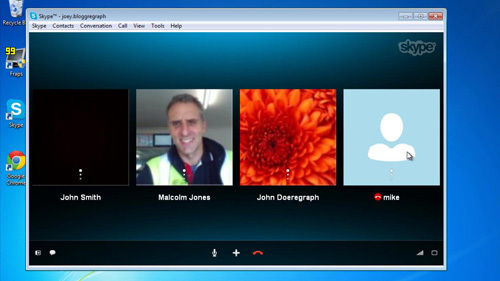 Skype conference calls can also be connected to landline numbers through Call Phones service. Please Note: Call Phone service is charged depending on the place where you are calling. If you want to add a landline or mobile contact number to your Conference call, first add it to your Skype contact list and enter the phone number in contact information. Before making a group or conference call, make sure the contacts are not busy on another call. This is shown differently on Windows and Mac. On Windows, you can see a moving ring surrounding the icon of the person who is currently on call. On Mac, the increased level of the sound meter of the person speaking shows that he is busy. Go to call section after the chat option in the left side. To make a conference call click on +call button above the contacts. After selecting the contacts, click on call button in top right. Click the Contacts tab. Make sure all the call participants are selected. Ctrl+click the dropped contact and then click the green call button. This way the dropped contact will be added to the ongoing call without closing the conversation. You can ask the person to join the call. He/she just needs to click the green calling button saying ‘Join Group’ to reconnect to the conversation. Another added feature during Skype conference call is text messages. The persons on the group call can utilize the text box at the bottom of the screen to type text messages or share links and images. Enjoy Skype’s wonderful effort to remove geographical boundaries and connect with loved ones. if you are getting any issue then please get connected with Skype customer service for any help.